Getting locked out of your car can be downright traumatic for some people. It is a very frustrating issue that needs to be addressed by a professional. As a car owner, the last thing you expect is having to cause additional damage to your car while trying to rescue yourself from the accidental lockout. This is one of the reasons why you should steer clear from untrained imposters who are only trying to profit from your misfortune. Hire professional services from Quick Safe & Keys Services Los Angeles. We have the best team of professionals to rescue you from the car lockout. We always ensure we conduct damage- free service and therefore you can always count on us. Our team has taken the time to analyze the main reasons people get locked out in the first place. Without further ado, here are some of the common causes of Car Lockout. In case you accidentally misplace the keys to your car, you will definitely face a lockout issue. If this happens to you, there is no need to feel frustrated. We have the best team to rescue you from such incidents. 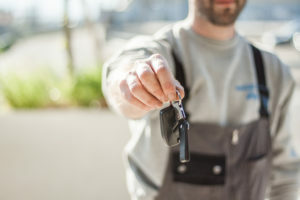 Our team handles car locks of different makes and therefore you can always count on us no matter the make of your car. The pattern on your car key is unique to the lock that it is made to open. Therefore, if the pattern is damaged, you will not be able to unlock the lock anymore which will only make you more frustrated. However, Quick Safe & Keys Service Los Angeles has your back and so there is no need to feel frustrated. We will repair the key and ensure you drive off in just minutes. Contact us in case you need our services and we will be glad to assist you. We believe that we are the best when it comes to Car Lockout Solutions. Therefore, you can always count on us to rescue you from a car lockout issue. One of the reasons we do what we do best is our ability to respond within the shortest time. We know that a lockout issue can be very frustrating. Therefore we will not allow frustration related to the car lockout to have any sort of impact on you. Our team is always ready to rescue you from such incidents. Secondly, we have the best workmanship required to rescue you. Our team of professionals is well trained and experienced. No matter the design of your car lock, we will rescue you. • How much does car lockout cost? This is one of the questions our clients ask. However, understand that this depends on the make of your car. Therefore, contact us and we will get back to you with a quote depending on your vehicle make and model. • It’s a weekend. Will your Technicians Be Readily Available Today? Any day of the week we will be available to serve you. We work 24/7 to ensure our clients are always satisfied. Therefore, contact us regardless of the day or what time it is. • How long will your Team take to unlock my Car? Based on past experiences and the exposure we’ve had, we always make sure our customers are served within the shortest time possible. Therefore, we are able to unlock your car in just a few minutes tops. Finally, contact Quick Safe & Keys Service Los Angeles if you want to get rescued quick from a car lockout. We always ensure that our customers are served within the shortest time possible. We are also readily available to offer the car lockout solutions to you at prices that won’t break the bank. So call us today at (323)275- 9246 for 100% satisfaction.